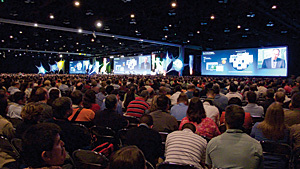 More than 14,000 Esri GIS users will come together August 48 at the 2008 Esri International User Conference (Esri UC) being held at the San Diego Convention Center in California. With more than 120 countries represented, as well as a mixture of industries and levels of experience, this year's gathering is expected to be a diverse and comprehensive event. The Esri community is invited to grow its knowledge of geospatial technology to share solutions, explore innovation and GIS tips and tricks, and put techniques to work. "The conference is always refreshing and gives me energy, motivation, and ideas when I return to the office," says Paul Buchanan, GIS coordinator for the Suwannee River Water Management District, Florida. "It's like catching your second wind when running. It's a hard week, like final exam week in college, if you tackle all the sessions possible, but it is well worth it." "It's probably the most amazing conference of any kind that I have attended," says Tammy Kobliuk, GIS coordinator for the City of St. Albert, Canada. "One comes away immensely proud to be a part of the GIS profession and enormously inspired to make a difference." "A user can have their finger on the pulse of GIS technology at this conference," says Jack Dangermond, Esri president. "Beyond the applications and approaches, the new vehicles for learning, and the flurry of activity, there's a sense of direction and meaning that makes this forum determined to make a difference." 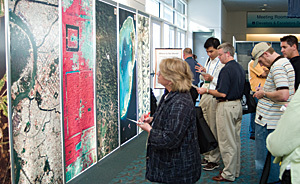 Users are encouraged to be part of the 2008 Map Gallery and showcase their unique uses of GIS. This year's Map Gallery will include digital maps for the first time. Multimedia Map Gallery entries will illustrate the results of using Esri technologies in a project or study but will not use Esri software to run the presentation itself. Entries can include a digital atlas, map series, collection of animations, interactive Web maps, slide show detailing the steps of GIS projects, and more. For both the Map Gallery and Multimedia Map Gallery contests, multiple entries can be submitted. In each category, the top three entries, voted on by a panel of judges, will be recognized by Dangermond during the Esri UC closing session, and first-place winners will receive a trophy. All map entries will be eligible for the People's Choice Award, which involves any attendee voting for their favorite entry during the conference week. Those interested can review the categories and submit their work at www.esri.com/uc. The deadline for submissions is July 7, 2008. Also new this year, the Map Critique Station has moved up to the Map Gallery area, where users will be able to get tips from expert cartographers on creating a more effective and professional map. Another way users can creatively participate in the conference is to submit images for use in Dangermond's opening presentation during the Plenary Session. Map images, videos, and photos must be submitted online by June 20, 2008. To find out more, visit www.esri.com/uc. Other highlights worth perusing this year are the Academic GIS Program Fair and the User Software Applications Fair. Held the first day of the conference, the Academic GIS Program Fair gives visitors the opportunity to meet with representatives from colleges and universities about their academic GIS programs and educational offerings. Tuesday through Thursday, attendees can visit the User Software Applications Fair to see custom GIS applications and programs using Esri software. Users who have developed an application program using Esri software or customized an Esri software product to meet specific end-user requirements will have their work on display. Held the weekend prior to the Esri UC, the 2008 Esri Education User Conference (EdUC) and the 2008 Esri Survey & Engineering GIS Summit will also offer presentations given by distinguished keynote speakers. At the EdUC, Dr. Anne Knowles, professor at Middlebury College and editor of Placing History and Past Time, Past Place, will discuss GIS use in historical scholarship and teaching history. During the Survey & Engineering GIS Summit, Colonel David Madden, commander of the GPS Wing at the Space Missile Systems Center, will share information about the largest avionics integration and installation program in the U.S. Department of Defense. At no additional cost, Esri UC, EdUC, or Survey & Engineering GIS Summit registrants can attend the HAZUS User Conference, which is sponsored by the Mitigation Division of the Federal Emergency Management Agency (FEMA). This meeting will focus on effective approaches for using HAZUS for decision making in government and private entity planning. The forum will take place August 56 at the Omni Hotel in San Diego. Those interested can sign up when registering for the other events. Another complimentary event is the Ecosystem Management Decision Support (EMDS) System Workshop being held Sunday, August 3. The EMDS system is used to provide decision support for a substantial portion of the adaptive management process of ecosystem management. Participants will hear from the EMDS development team, now a private nonprofit consortium. For attendees who crave some physical activity, the Esri UC offers the golf and tennis tournaments and the 5K Fun Run/Walk. Stroll the fairways, pick up a racket, or grab a jogging partner. The Golf Tournament will take place at the La Costa Resort & Spa in Carlsbad, which is the current host of the Accenture Match Play Championships. The deadline to sign up is July 3, 2008. Lastly, the GIS Kids Camp is a great way for the children of attendees to explore geography and GIS through hands-on learning experiences. The Esri UC is for all Esri GIS users. To find out more about the conference week and to register, visit www.esri.com/uc. For further information, contact Esri (tel. : 909-793-2853, ext. 1-1363; e-mail: uc@esri.com).